And here we have it! 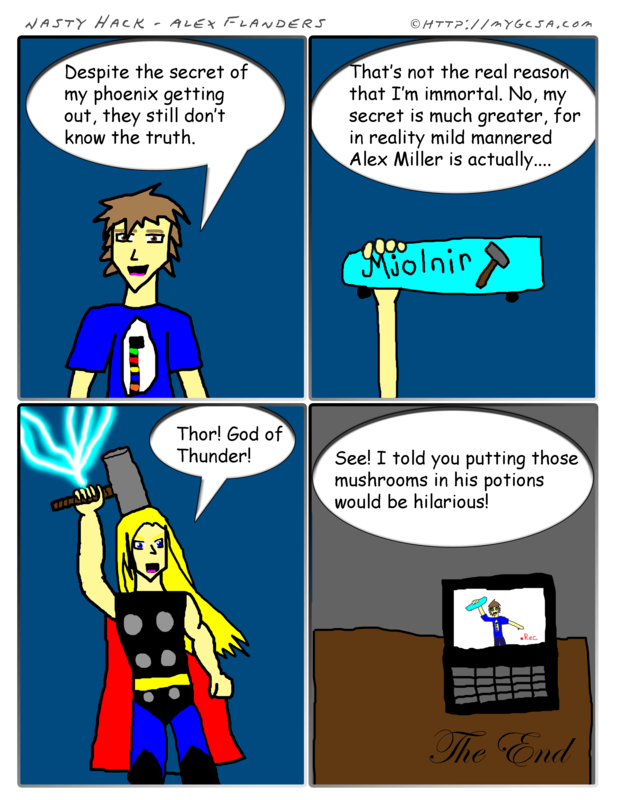 The final comic in the Miller story arch! I’d like to think of this final piece as one final middle finger to the boy that we all love to hurt and maim! At any rate, it’s finally through. This has been a twisting and turning adventure, and I am truly glad that all of you have stuck with me during its creation. Personally, I think it was a success. So I’m going to get back to the drawing board and see if I can’t figure out a few more ideas for the story. I already possibly have two ideas, but we will see how if I can think up enough ideas for them to make them a reality. In other news, I will be departing for Alabama in the next two weeks. That means that there is a possible chance that there will be no Nasty Hack on April 29th. However, seeing as how I am in fact that undisputed God of Awesome, I might spin my webs and have a comic ready and let Carter post it for me. We shall see. For now, enjoy the finale! Lol, good one Flandroz. But seriously… We have technology. Go to your GCSA dashboard and make a post. Set the publish date to the Friday you’ll be away from your computer and the system will take care of it for you.